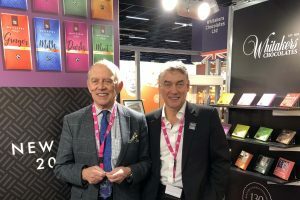 “Business as usual is no longer an option” was the outcome of the World Cocoa Conference in Berlin nine months ago, signalling the need for a new beginning, but has the cocoa sector become more sustainable since then? 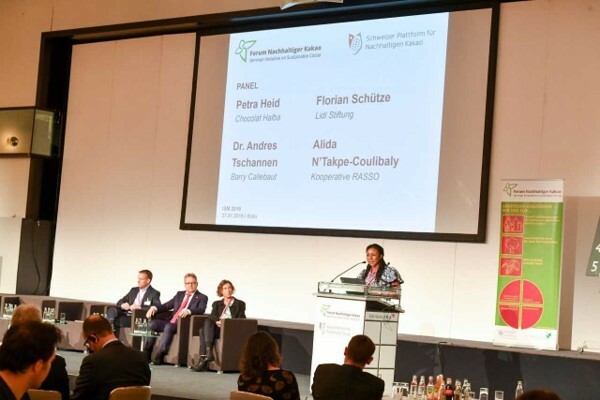 This question was discussed by three representatives of the confectionery industry and the food retailers and a co-operative representative from Côte d’Ivoire, at a joint event of the German Initiative on Sustainable Cocoa and the Swiss Platform for Sustainable Cocoa at ISM in Cologne last month. The participants at the discussion event felt that progress has been made since last year, especially in terms of co-operation at international level and between the various actors from private sector, government and civil society, such as the Cocoa & Forests-Initiative to end deforestation. 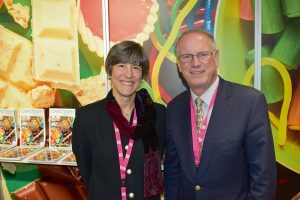 The Swiss and German sustainability platforms have joined forces with further key actors from civil society and the private sector, the Deutsche Gesellschaft für Internationale Zusammenarbeit (GIZ) and other organisations to establish an international working group on providing a living income for cocoa farmers. The Task Force Living Income aims to develop solutions to close the income gap that exists between the current income of cocoa farmers, which is mostly below the poverty line (USD $1.90 per person per day as defined by the World Bank), and a living income. The Parliamentary State Secretary of the Federal Ministry of Food and Agriculture (BMEL), Hans-Joachim Fuchtel, as well as the Deputy Consul General of Switzerland in Frankfurt a. M., HansPeter Willi, addressed in their opening speeches the need to develop a clear structure and a common understanding for the entire supply chain. Petra Heid of Chocolats Halba named three essential elements to strengthen producers: training, especially in cultivation with a focus on diversification through mixed cultures, but also in accounting and farm management, in order to achieve secure nutrition and greater economic independence. Pre-financing also is an important element in facilitating investment. Alida N’Takpe-Coulibaly, the representative of an Ivorian cocoa farmers’ co-operative, pointed out that farmers need stronger support in their step towards a safer economic existence. “They need to learn and develop an understanding of how to manage their income,” she said. Income could also be saved or invested, but this would require a rethink on the part of farmers and could only be achieved through long-term support and coaching. “Many young people are interested in agriculture. It is important to involve them more in projects,” she said. 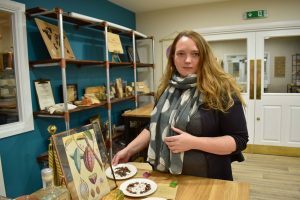 Alida herself studied economics, but then decided to continue her family’s cocoa farming tradition and founded the co-operative RASSO in 2015. Since then, the number of members has grown continuously from around 100 to over 800, of whom more than 300 are women. Lucas Simons of NewForesight moderated the event and has broad knowledge of sustainability, challenges and solutions. He said the start has been made. The sector is at a crossroads where a disorderly juxtaposition of many initiatives creates a system where actors develop mutual trust, co-ordinate and work towards a common goal. “I see us close to this point,” Simons said, calling for the trust that has grown to be nurtured and further strengthened.